fewer than a third of Dutch people have a religious faith and nearly one in four describe themselves as atheists, according to the latest census of belief in the Netherlands. Around 2,100 people were canvassed for the ‘God in Nederland’ survey, which has been carried out every 10 years since 1996. The trend towards secularization also saw a decline in the number of people describing themselves as spiritual, which dropped from 40% 10 years ago to 31%. The number who believed in the existence of a higher power fell from 36% to 28% over the same period. Overall 25% of people identified themselves as Christian, while 5% were Muslim and 2% belonged to another faith group. Within the Christian group the survey also found a trend towards more secular beliefs. Just 13% of Catholics believe in heaven and fewer than half believe that Jesus is the Son of God. The trend was less pronounced among the Protestant congregations. Not only is there a great prayer need for continued outreach to the Dutch population, but also over the past few years there has been an influx of refugees in the Netherlands as well as throughout Europe due to the middle east crisis. My colleague, Patricia, and her husband, Matthijs, and I have united together to reach out to refugees in the city by using a ministry model called the Four Fields. We are praying for and seeking “persons of peace” to share the gospel with and ultimately to see people multiply their lives into others to begin “churches”: small groups of people meeting together as they grow in their faith. Please pray for the Lord’s wisdom and guidance us as we lead others in Discovery Bible studies and in sharing the story of God’s love through Jesus. We’re praying for salvations and followers of Christ. Diaspora: the movement, migration, or scattering of a people away from an established or ancestral homeland. This is part of Vision 2020 within Great Commission Europe (GCE). These learning communities will include believers who are involved in GCE churches, experienced evangelists / disciplers, local church leaders, and others in the community who are interested in furthering their personal ministry with this population. These learning communities will be critical to further envision, equip, encourage, and implement a more focused ministry toward these immigrants and refugees in the affected GCE churches. 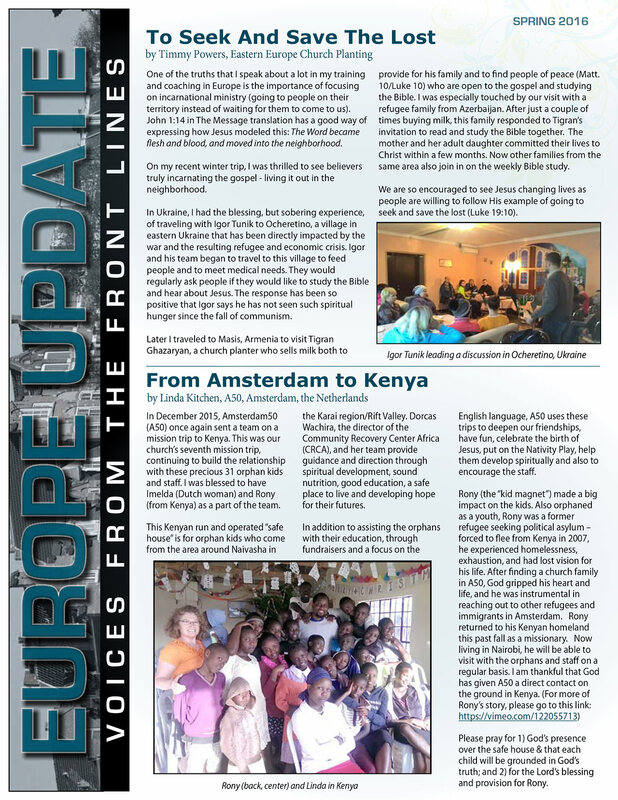 The Europe Update “Spring” newsletter’s theme is "Voices from the Front Lines", where the story of Rony, who was a part of Amsterdam50 before moving back to Kenya as a missionary, is shared. Open the second attachment for the news. 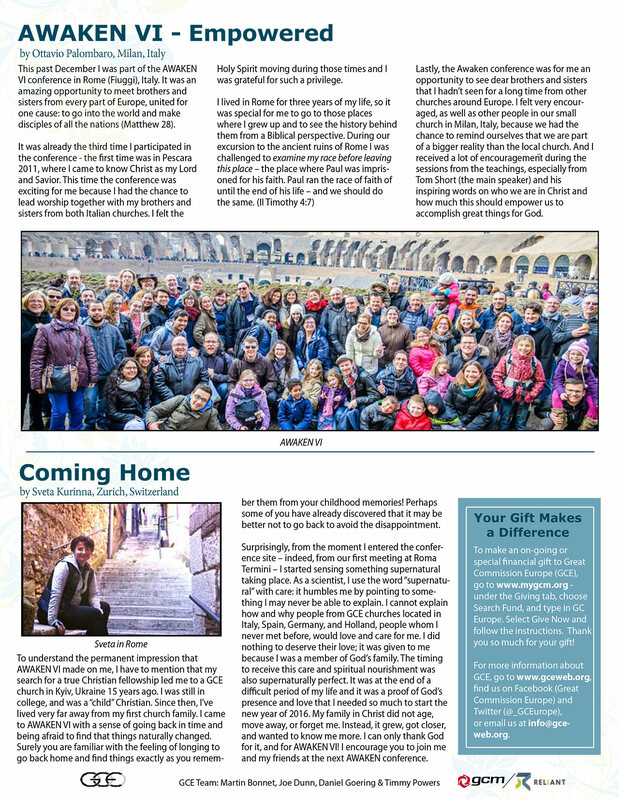 May the Lord move powerfully all over Europe and beyond growing His Kingdom of love! Thank you for your prayers over the past months regarding my health and the health of Rama, one of my cats. It has been determined that he does not have a food allergy, but rather a similar disease as his brother, Akela, who was born showing the symptoms of a compromised immune system. Rama is now on the same medication and doing very well. My wrist is about 98% healed and my left toe/foot are continuing to improve. I’m also on the mend from a bike accident, resulting in bruised ribs. Thank you, prayer warriors! !